These were uncharted waters. Dodging an ice berg and a possibly a Kraken, me ship made it to Powai. I took out the map and me compass. I felt, I was a bit lost. I could not spot land anywhere. After a tiring journey which is best described in my other bulky journal, I made it to my destination. A land full of fancy restaurants and grog holes. I stepped in front of me destination and raised my hands in joy. Hurrah! Land Ahoy at Chili's. It had been a long trip from the Northern suburbs. There I stood staring at Chili's logo. It looked like some kind of a UCO. An Unidentified Chili Object to be precise. Chili's is yet another American chain of restaurants to enter India. 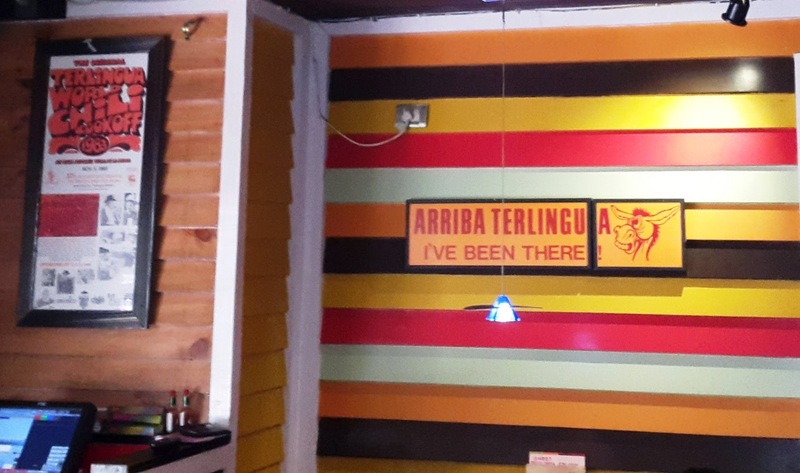 It specializes in American food and most notably the Tex-Mex cuisine. But its level of food classifies as Gourmet grade or fine dine. No you have not tasted true Mexican food at Taco Bell's. If you want the real deal and good food, Chili's is a far superior and genuine option. 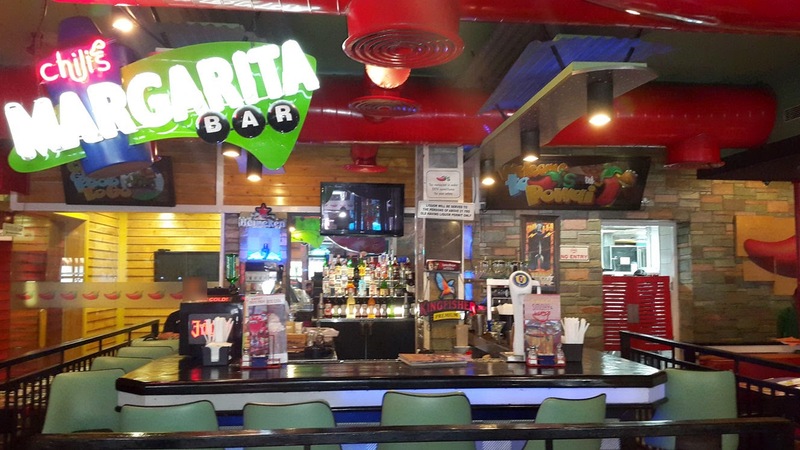 When I sat down inside Chili's, I only thought of one thing, "The food better be darn good. It has to make up for the long trip." And it was. Captain : A fine restaurant this be. Its crew be so well mannered. Crewmate : Captain your eyes are glittering with admiration. Captain : Shut yer trap lad. I am a man of the sea. My eyes don't shine like an anime character. The service was excellent. I had read a few complaints regarding Chili's service but I found no issues on my trip whatsoever. The staff is pleasant and well trained. They handled my table and the ones around me quite well. It is probable that it maybe a bit slower during rush hours but that is excusable. The restaurant has a grand ambiance. It has a large dining area and a really classy cocktail bar. The bar seems to blend in well with the surroundings. But once you step into or near it, it transports you to an other realm. It feels like you are in a pub and not a restaurant. I really liked the large Margarita sign. Pretty sure it has been clicked a hundred thousand times before but I shall click one for keepsakes anyway. Good memories. Before my meal began, I had an opportunity to meet with Chef Abhijeet Gomare who is the culinary contact for Chili's South and west India. He is a bit of a celebrity in the culinary world with articles related to him appearing in mainstream media. He told me about Chili's plans and vision for the future. It was a great experience talking to him. When he is not busy coming up with new menus, he is probably busy collecting flyer miles traveling back and forth between Chili's restaurants across many cities. People from the Western suburbs and Sobo area do not travel to Powai that often. It is often considered too far away but it is quite developed and to some extent even more than Sobo area itself. Chili's was a good reward for my quest to Powai which surprisingly is easy to reach from western suburbs. Service check, Ambiance check, Time to move on to the (Drum rolls) Food ! Before my appetizers were served, I chose to start with a drink. Anything made at that awesome cocktail bar has to be awesome. 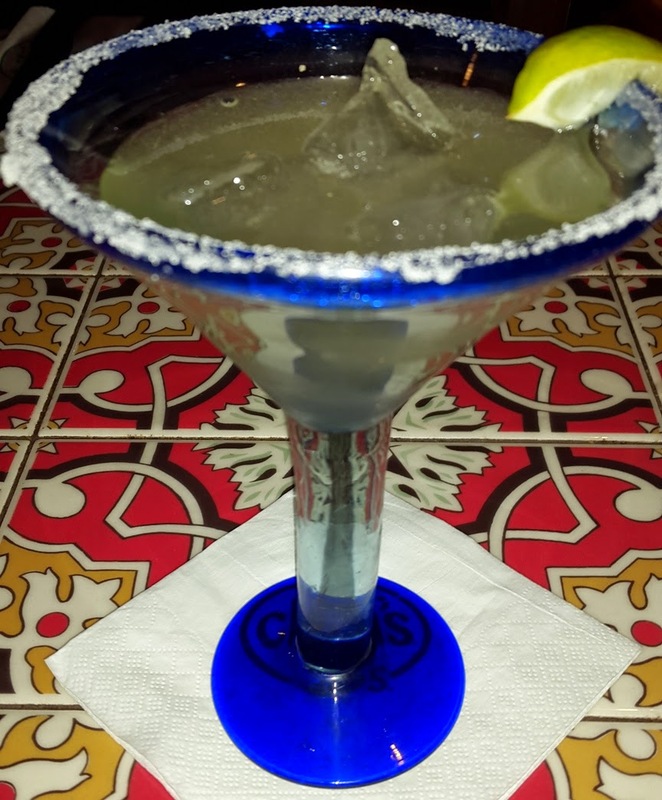 I started with Chili's El Presidente Margarita which was a recommended drink. The glass, the appearance and way the drink was served out of a blue mixing tumbler. It made an excellent presentation. The drink was a mix of lime, Brandy and the good ol Tequila. It was tangy, sweet and fizzy. The mixer knew what he was doing. I think it could be my regular for my future Chili trips. "You ain't had Mexican till you have Tequila pardner." 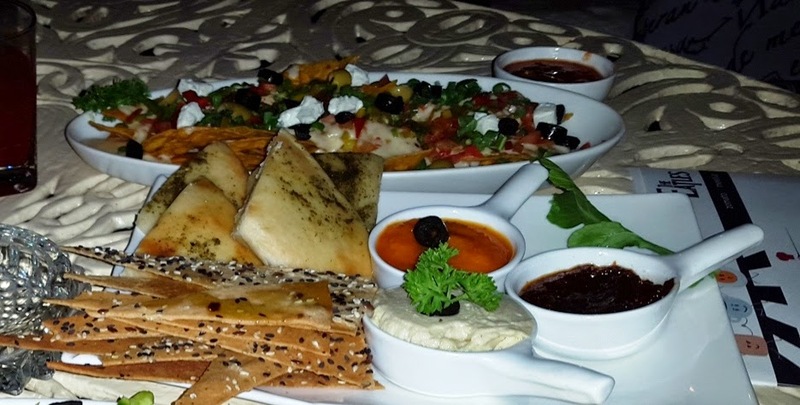 I chose the Triple Dipper option on the menu as it allowed me to experience most of the non vegetarian appetizers. The Chicken crisper was hands down the MVF (Most valuable Food) among the three. In the picture they are located towards the upper right corner. These are Chicken tenderloins wrapped in flour. Finger licking good and went great with the ranch sauce and honey mustard dips. Although, its best suited to be eaten with Honey mustard. The item in the Top left corner is Buffalo Wings. It is the big daddy of all chicken wings. Much better than the sham you have at KFCs. It is bony but tasty with the sauces wrapping the deep fried chicken adding a bit of tang to it. The last item at the south end is the Boneless Chicken wings. Same as the Buffalo wings but no bones and more meat. Good for those of us who don't like to deal with messy bones in their food. These felt juicier than the Buffalo wings. 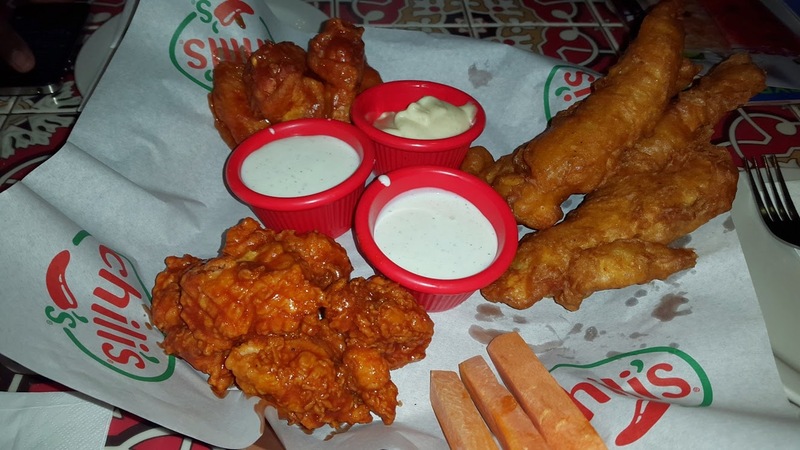 If I had to choose between Buffalo wings and the boneless ones then the latter gets my favor. They were served with carrot sticks which were part of the combination. And let me assure you, these were served in large king size portions. It was difficult for me to even finish these alone. Totally worth the money. Captain : Its so tasty but I cannot finish this. Crewmate : I often wonder Cappy, Why don't we get the rest of the crew to join us in restaurant trips? Captain: Ever heard three's a crowd? Imagine that with ten lad. My main course started with Sweet Mustard seed baby back ribs. I have never had pork ribs before. And this was certainly a large and an overwhelming dish. Served with a Good ol' corn on the cob and french fries. The corn was sweet and juicy. 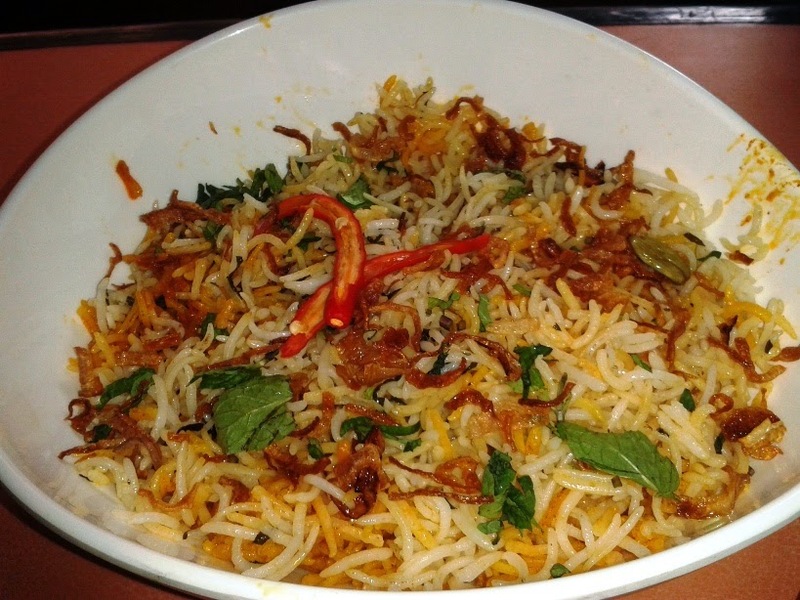 Not something we are used to here in India where Bhuna Bhuta is crispy and salty. The fries were rich and definitely leagues better than what one has at a certain clown themed American burger chain. The ribs can be a bit of an effort to eat. But its worth it. Juicy Tender meat on ribs coated with Chili's own Barbeque sauce. The sauce is made with mustard seeds, honey and Worcestershire sauce. It is one of the best BBQ variants I have ever had. I am instantly won over by anything with BBQ sauce, so I really loved the ribs. Despite not being a person who likes bones, I found myself enjoying this. The meat was tender and the taste had sunk in quite well. There was not even a single bite that felt dissatisfying. This item was found on their special event menu which is an ever changing list of items they test with their customers. The best items make it to the main menu while the rest are given a Spartan farewell. I am told that this item is most likely to make it to their main menu but just in case if its not, now would be a good time to have a portion of this because "Zindagi Na Milegi Dobara"
This is a volcano that I would love to see go off. 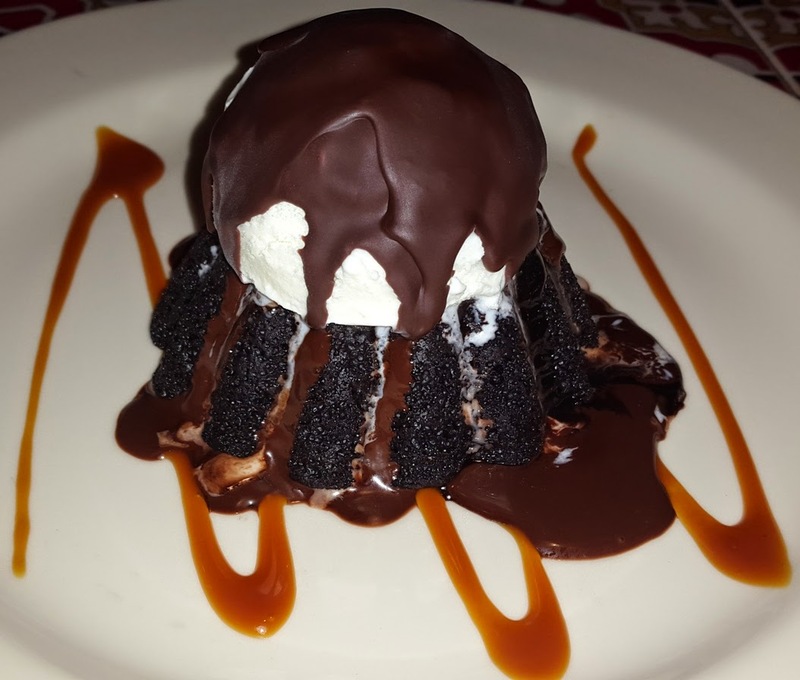 Chili's Molten Lava Cake is one of their most popular desserts. Despite me being on team Cheesecake, I still opted for this on the restaurant's General manager's recommendation. And a great recommendation it was. Soft Chocolate cake filled with rich gooey chocolate lava. Topped with a dollop of Vanilla ice cream and covered with rich chocolate sauce. And the Caramel artwork for presentation. This item was visibly enticing. Looked like a fine work of sculpted art. The chocolate sauce trickling down the cake ridges was a clever way of enhancing its presentation. Such shame to destroy it and a bigger shame not to eat it ha. The best way to eat it is to have all layers in each bite. That is the way that it is intended to be eaten. If you attack the layers one by one, you will ruin the experience. 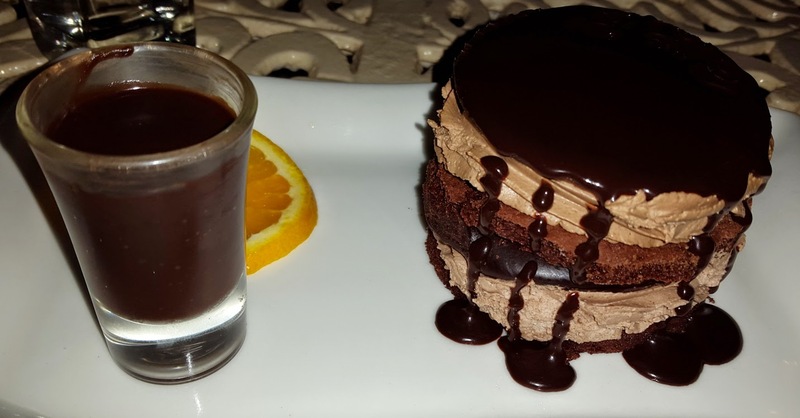 It is hard but having a bite with the cake, choco lava, ice cream and sauce form the complete alchemy in your mouth and taste great. Definitely Recommended. Captain : This lad be a true treasure of the culinary sea. Crewmate : I understand Captain, now please share some with me. With the dessert gone, it was time wrap things up. The meal was memorable. The people were memorable and I would definitely remember that cocktail bar. Chilli's can be a little expensive. But it is completely worth it. Their portion sizes are King size and they definitely fill you up. It is one Mumbai's better restaurants and a nice stop for food lovers everywhere. Also, makes it to my list of top five for 2014. I found this as a nice keep sake. To show future whipper snappers a memento of my First Chili's trip. 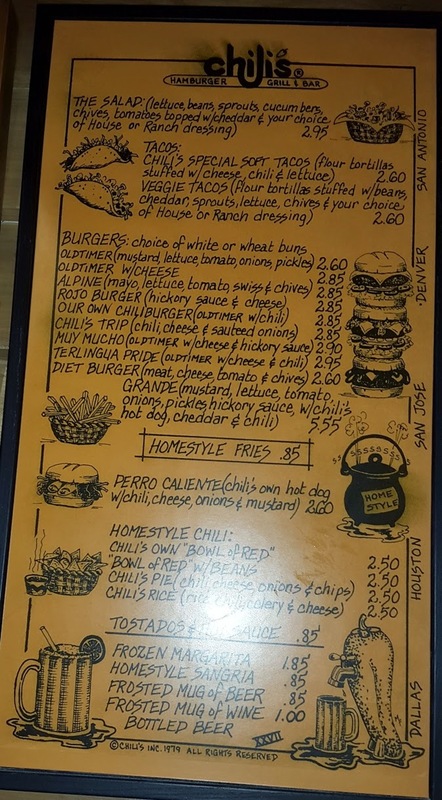 Here is a picture of Chilli's first menu when it opened shop in the 70s. "We will probably be back here someday lads. But for now, it's back to sea faring for us." A dark night she be. Lit by the stars in the sky and the bright lights of food islands in the distance, the course is set. I be invited to a convention of fellow foodaneers. Yes there be such a word as foodaneers. Excited and intrigued to visit fellow Captains, I move at full speed towards my destination, The little door. What lies behind it, no one knows. "Let's make a deal. Would you like to go with Door number one ? But Monty there is just a single little blue door there. So let us open it then." The Little Door is a restaurant lounge which is quite popular in the Lokhandwala food district. Away from the congested Linking road, away from the pollution and in between hotels and residential lanes is The Little Door. 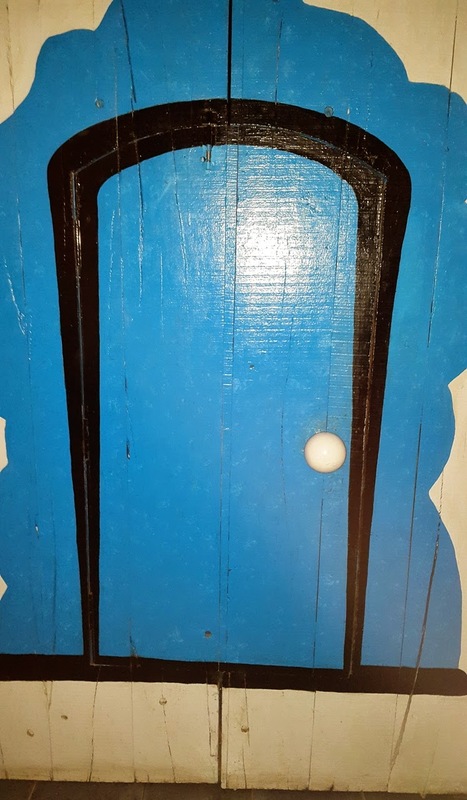 This door hides a small world full of cheer and arcane. It was a year's end event hosted by Zomato and quite a few fellows had been invited. Upon meeting a few familiar faces and a lot of unfamiliar ones, I socialized for a bit before I settled for a bite. We were greeted by our hosts, the pleasant faced Zomato team. The restaurant is split into two zones. The interior area which is a small but a typical lounge with live music and DJ. The exterior is a slightly larger area that would have been classified as Al Fresco if didn't have an organic roof overhead. The lounge was full of college kids and the like. It was noisy and full of cigarette smoke but nevertheless had a special feel to it. It is not a typical place where one goes for a meal. Its a place where one goes for a celebration. Whether its your promotion or your neighbor's second cousin's friend's promotion - feel like celebrating? Come to TLD. It may feel a bit off to those looking for good food in a peaceful environment; but hey if you want to down a few pegs and chill then come right here.When you win, you party. When you lose, you party harder. 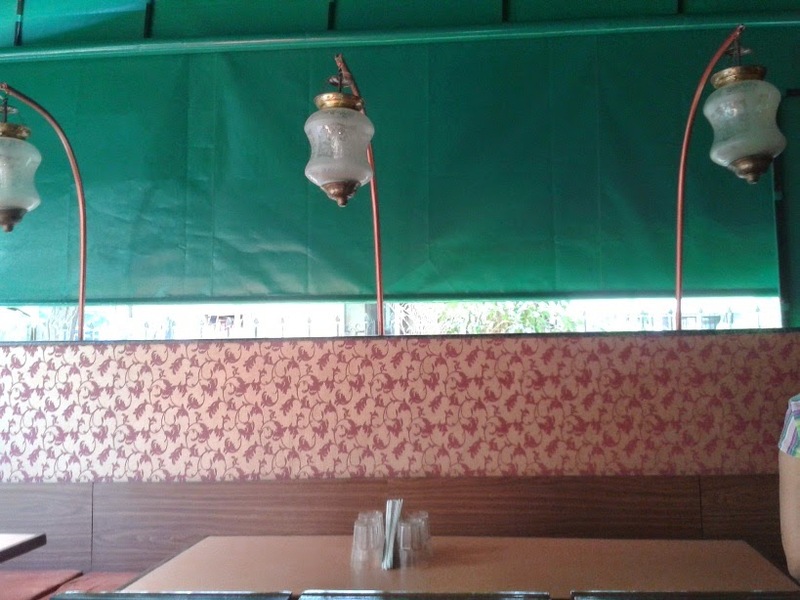 The ambiance is not perfect but does fare satisfactorily. The crowd could be a bit noisy so it may not make the best place for a romantic date. The area however is clean and there are no annoying insects bothering the patrons. It also feels much more classy than most watering holes in Mumbai. Our sojourn was flagged of with drinks and entrée from a special menu prepared for us. I started with a Peach Beer. It was all right. Tasted a bit mediocre but didn't give me a good reason to complain about. I was told post event that Blushy Pink Sangria would have been a good choice but I was not briefed on the same by the serving staff when I asked for suggestions. Captain : No rum on the menu, Blasphemy ! Crewmate : Shall we remain sober today, Captain? Called Tlata or three in Morrocan, more specifically TLD tlata-this was an interesting starter. Comprising of Pita and thin Lavash, it was an ideal thing to pass away time while talking with other epicures. The Pita was tasty but had a hint of Indian adaptations to it. It went well with the hummus bread. The Lavash was crispy, savory and went rather well with the orange sun dried tomato dip. Next up were Greek Nachos. A fusion between Greek themes and classical Spanish Nachos. The Nachos tasted great with the feta cheese addition. Despite tasting great, the flavor had an undeniable infusion of Indian spices and flavors to it. My palate loved it but my mind suggested that it wasn't quite continental. However, it served as a great starter. Next up were the Three Amigos. From left to right - Pita slider, Baby Brava and Vol au Vent. The Pita sliders were undeniably the best of the trio. Had a wholesome Lebanese flavor and left a good after taste. The Baby Brava was all right, felt a little low on flavor. The Vol au vent is a doughy puffy pastry filled with a dip. The dip did feel nice but somehow the doughy flavor of the pastry felt a wee bit overpowering over the rest of the item. Captain : I am having this alone. All mine. You can have the rest of the grub lad. Named Strixxi Mimli, it sure confused me. What in the world does that even mean? Apparently it means stuffed strips in Maltese (Thanks Google Translate). These were chicken strips with a cheesy gooey filling and Mediterranean herbs. However, these resembled croquettes despite the naming. They were tasty and quite addicting. Chicken and cheese are always a good combination. The dip served was Onion garlic mayonnaise which seemed to complement the strips well. Crewmate : Strixxi what ? Captain : (Takes out reading glasses and takes out world dictionary) I can't find it in here lad. Crewmate : Why are you still using that little handbook Captain ? Don't you have a smartphone? At this point, I was beginning to wonder whether we would have a main course at all or not. But thankfully Shrimp Brochette marked an end to the Entrees. 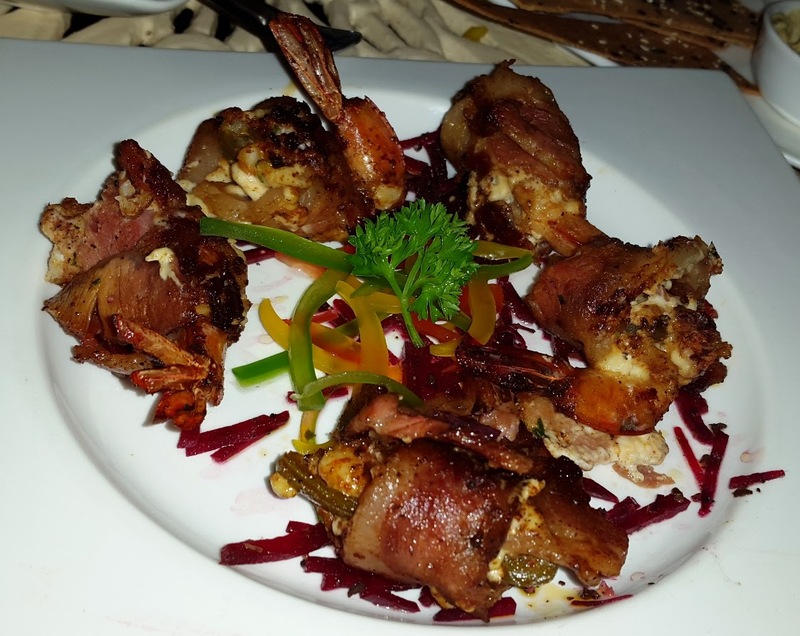 A house specialty wrapped with tasty cheese and bacon, it was one of the best Shrimp preparations that I have ever had so far. Chewy, cheesy and tasty. I would have actually had more of this, had the main course not been there. Takes a close second after the Pollo verde. The chef also left a bit of an artistic touch to its visual appeal. 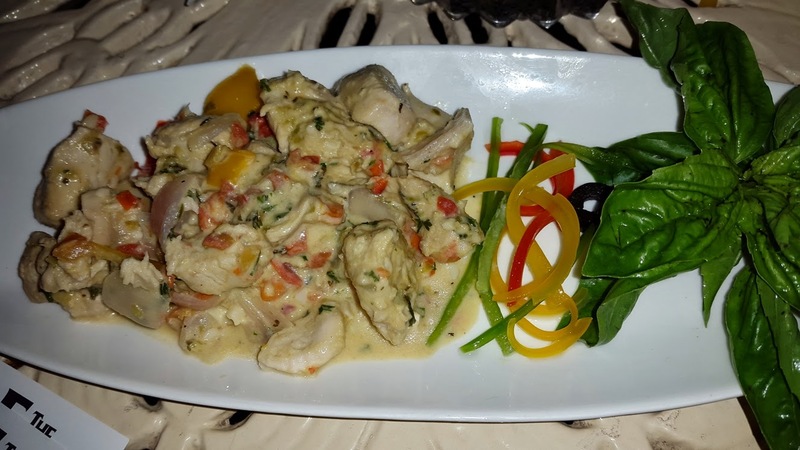 My choice of main course was Pollo Con Salsa Al Pepe (Chicken with Salsa in English). 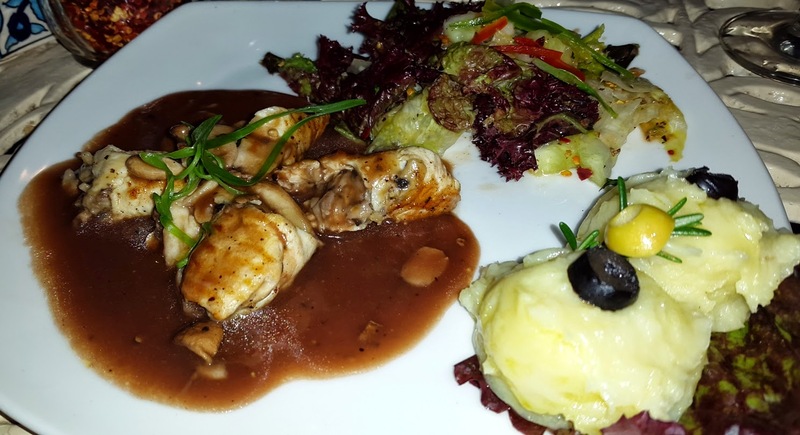 Thin portions of chicken breast rolled with mushroom. Then grilled and served with pepper sauce. Complemented with a creamy potato mashing. I have had a similar preparation to this before in an Italian restaurant. The taste here seemed to lack bang in comparison. It felt quite mild. The portion sizes also were not filling and the dish somewhat felt like an extended part of the entrée course rather than the main course. 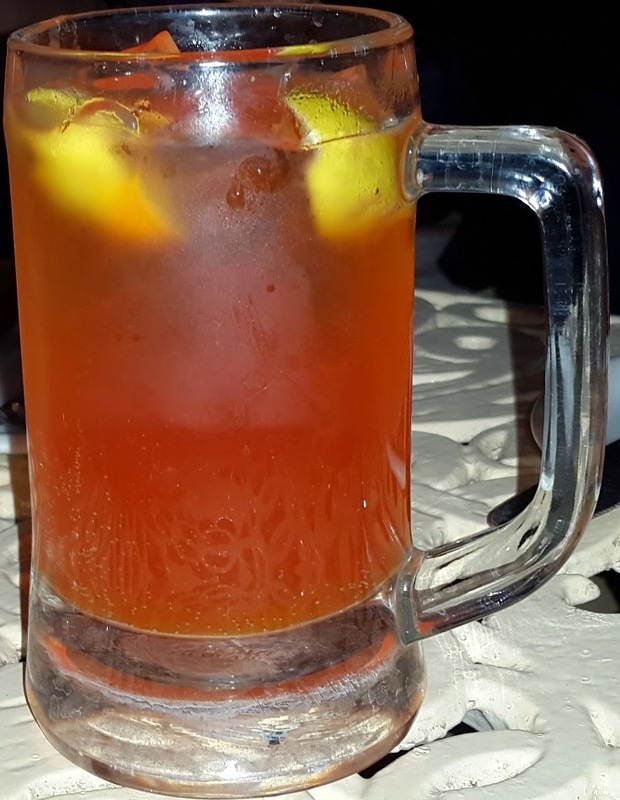 The Rum drum is a house specialty and the invention of the restaurant. It is visibly enticing, full of rich chocolate and good quality Rum. Billed as an eight textured chocolate cake. It definitely has several layers of cake, chocolate, mousse and rum filling. The mousse was very well layered and looked like a fine work of art from the outside. It was one of the favorite creations of Head Chef Nikhil Kedar. He spoke about it with such pride that I knew that it would be special. The upper hard shell was a little tough to break and it presented a risk of demolishing the entire dessert. However, I managed to get past that hurdle and enjoy my dessert. Loved the soft mousse mantle, the cake core with the rum surprise hidden within. A great end to a good evening. Crewmate : Here you go Captain! Crewmates : (Wiping the Captain's sweat) Are you all right Captain ? Captain : Yes, I managed to cut this thing without blowing it up. To conclude, I'd say that it was a great experience. A little noisy, cramped and smokey but works well if you are in the mood for a celebration. It is reminiscent of premium watering holes and good pubs across the city. In comparison with similar premium pubs, TLD has lower prices. It is the kind of place where you could have a drink or two with your buddies every day. Does need to improve on the food and perhaps un-cramp the space. "Lift the Anchors and unfurl the sails! Let's cruise under the stars, singing the ocean's song." Sailing through congested sea lanes is always a tiring task. Me ship's radar picked up a new but relatively obscure place in Andheri West. After a long voyage, I docked near a large island of restaurants. Facing old giants such as Quessos and Shreeji's was Kareem's. It is not a giant restaurant or a famous grog hole but it has a nice Tavernesque appearance with food fit for a Captain. Kareem's seems to be a pretty popular name for Indian-Mughlai cuisine franchises. Let me clarify to the reader that this chain is Mumbai based only and the one in Delhi or the US are different. Being part of a franchise model chain, each Kareem's outlet has a different management and its own unique features. One thing that I notice about different Kareem's are their different color menus. This is quite fun. Adds a bit of a "gotta visit em all" thing to it. Yes I totally did not copy that from elsewhere. This outlet is in a by lane with a not so impressive facade - Credits go to the BMC for digging up the roads and obstructing the restaurant. 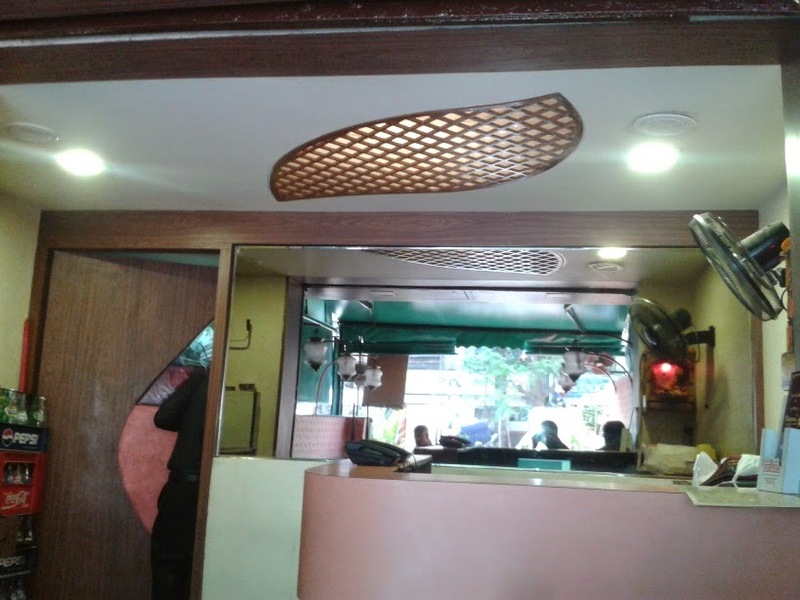 However, the restaurant itself is well maintained and clean. It has a small bistro like appearance but in my romantic sense of adventure - I thought that it resembled a small tavern. The kind of place where you love hanging out at your office lunch breaks. Or the kind of place you would love to go with your group of friends to. The owners must be commended for taking the bull by the horns. Facing popular eateries like Quesso's, Shreejis and surrounded by many popular restaurants including several Mughlai type restaurants. It is akin to a skinny gladiator facing a hungry Lion. Excuse the bad pun. Yet, Kareem's seem to be doing good business. I went there during late afternoon. It was way way past lunch time, yet there were many customers going in and out. In a way, I felt relieved that I did not go there during lunch time since I wont have a place to sit. Another noteworthy thing is the fact that the owner personally supervises the restaurant. She ensures each guest is seated comfortably and that their orders are taken and delivered. I always have respect for an eatery where the owner personally ensures that the wheels turn smoothly. All righty enough chitchat, lets get to the most important thing - the food. Captain : I would like the Kaali Mirch Kebab. Crew mate : I would like the Peeli Mirch Kebab. Captain : That is a dilemma of choices matey. Crew mate : No, it isn't Cap. Let's split it two ways. Savor the picture, this is one of my best grabs with my old camera. Seeing it alone makes me hungry. The upper three kebabs are the Pili Mirch Kebabs which are the house specialty. The lower half is the triplet of Kaali Mirch Kebabs. I have had Kebabs in many places including street side stalls and fine dining restaurants. And the Kebabs here are definitely among the best that I have ever had. The Pili mirch Kebab lives up to its repute and was perfectly cooked. No burnt portions, great textured, tender and succulent. Full of rich flavor. These Kebabs had a base flavor of Chicken Tikka and were complemented by the spice of Pili Mirch( Yellow peppers). Pilli Mirch kebab is a rare thing among many other Kebab places. You do not find it in most Mughlai restaurants. To be able to get it so easily at Kareem's is quite convenient. This was without a shred of doubt the best item I had at Kareem's. It is a must try for all those who love their kebabs. Kaali Mirch Kebabs are mild kebabs in terms of spice. 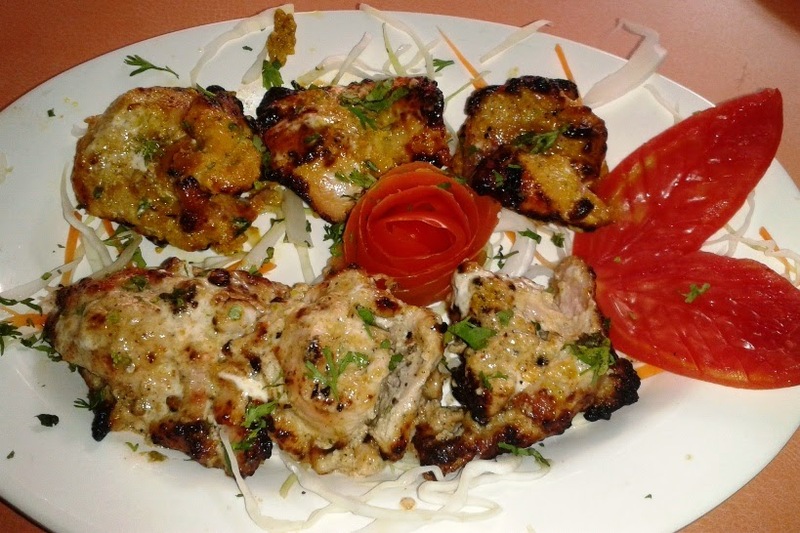 They have a distinct flavor of Murg Malai Tikka with a hint of black pepper. If you are not fond of spices then Kaali Mirch Kebabs make a perfect choice. The lip smacking flavor of Creamed chicken is bound to leave you asking for more. If you love your food extra spicy, the Hari Mirch Kebab is the way to go. Captain : I am the Captain matey, Let me have the Kebabs . Crewmate : Dont be greedy Cap, A good crew leader always shares his food. Captain : Ha, where in the seven seas did you hear that from lad? Despite its appearance, Kareem's is much more than a Kebab house. 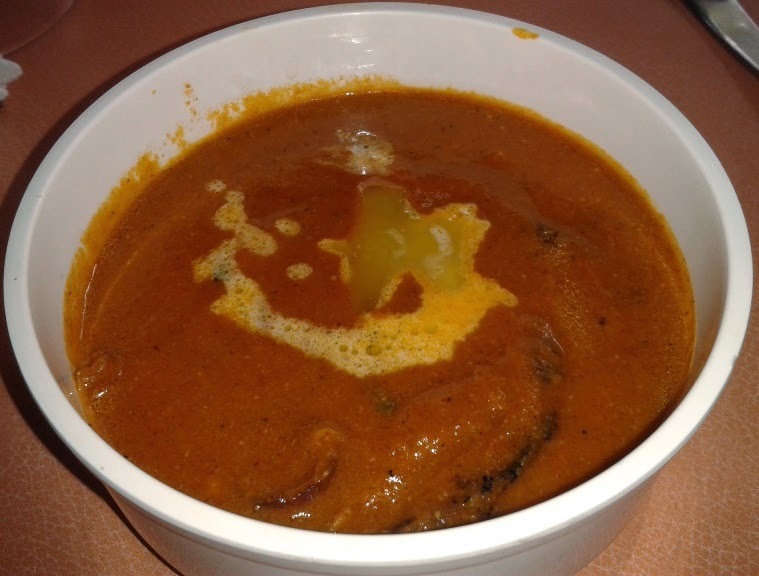 It offers most of the typical expectations of the North Indian - Mughlai fare. The mutton Biryani is quite decent. Moderately greasy and full of flavor. It isn't the best Mutton Biryani that I have had but it is the kind of thing that I can order everyday to satiate my Biryani craving. The boneless mutton pieces are a winner for those of us who don't like to eat bones with food. The flavor had sunk in pretty well and the temperature is just right. You wont burn your mouth with the first bite. The aroma is lovely too. Not too spicy and not too mild, just right. For those who are interested in a more Naan-curry fare, Kareem's offers a good variety of chicken and mutton dishes. 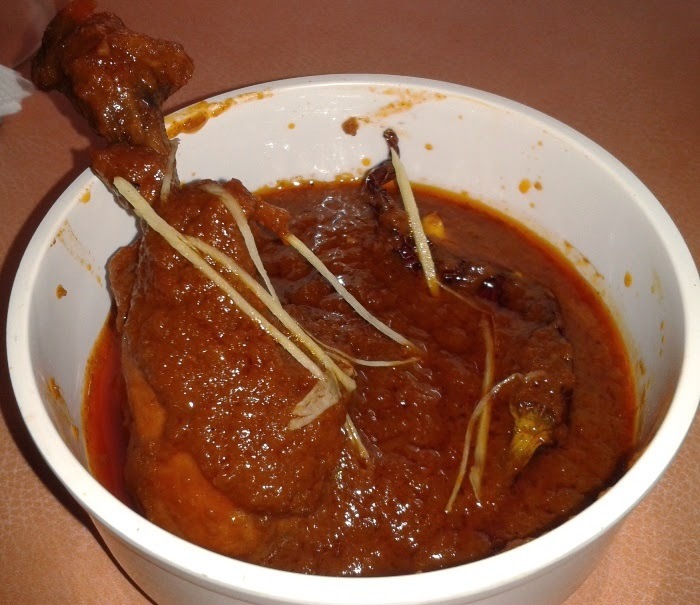 Karachi Chicken is another one of the house specialties. An item that varies from restaurant to restaurant. While the taste of Kareem's Karachi chicken was acceptable. I felt that the flavor of tomato was too overpowering. It kind of suppressed the flavor of other things. I guess a little less tomato would be better. The Good Ol' Butter chicken. How could I write about a Mughlai place without trying its Butter chicken? A crowd favorite for decades and one of my all time favorite foods, I keep hunting for places that serve good Butter Chicken. Kareem's Butter chicken had rather thin gravy and was a wee bit sweet. But it did not compromise on the flavor. The flavor was rich enough for me to completely finish the gravy as well. The chicken pieces were soft, well marinated and the flavor of the chicken dominated the dish. Not the best Butter Chicken out there but good enough for me. And I am very particular about the Butter Chicken in Mughlai restaurants, the slightest taste issue could make me snap. Again an item that I could order everyday to eat at home. Goes best with Naan. Crewmate : Captain, didn't we also have Butter Chicken on our table? Coz I don't see it. Captain: (Burrp) Butter chicken ? I have absolutely no idea what you are talking about lad. Crewmate : You ate it all alone didn't you ? And what meal is ever complete without a dessert ? 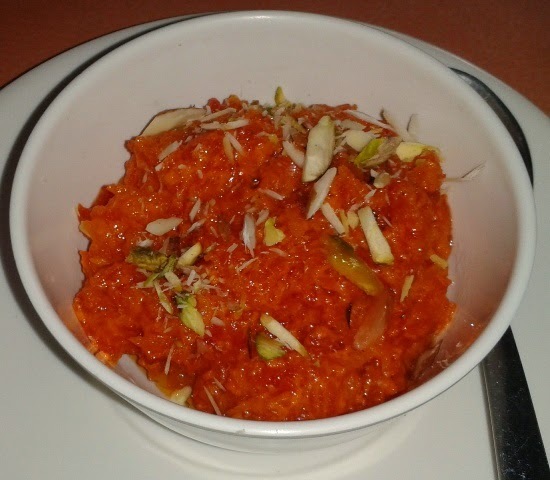 I was suggested to try the Gajar Halwa. It was surprisingly light, less oily and full of flavor. Just like the Gajar Halwa made at home.It definitely beat the Halwa sold at many sweet makers and Halwais. It was extremely tasty, full of dry fruits and had a wonderful sweet aroma. It was finely cooked and had no anomalies like odd lumps. It was fresh and definitely a great way to end my Kareem's meal. Like most Indian restaurants, Kareem's also sells vegetarian food and Chinese food. But I believe in trying the things the place is best known for. Kareem's has a great Chicken and Mutton fare. Worth a try, if you live in the Andheri Lokhandwala area or nearby. They deliver up to seven Bungalows neighborhood too so they cover a pretty large part of the Andheri west area. The service at present is good since the owner herself monitors the serving process. Feedback is taken well, dishes are recommended and described properly. The ambiance despite the initial appearances works for me. Its tavern-dhaba like appearance seems to appeal to me. Sometimes, the best experiences are not found in a super fine dine but in a small tavern along the road. But I would like to add a caveat to those who are particular about ambiance. It is a small restaurant and will not come of as very impressive to those who are used to big restaurants. However, the food is made in a clean kitchen , doesn't have an excess of grease and tastes great. The pricing is on par with most North Indian restaurants in Mumbai. However, it is much cheaper than luxury dining places like Zaffaran. The kebab quality is on par with those served at Zaffaran but at a cheaper cost. Good quality food at mediocre prices. Something that works well for everyone. To conclude, I shall ask myself a question. Would I go again to Kareem's? The answer - Yep of course. "Its time to take the ship out lads. There are places to be and restaurants to try."